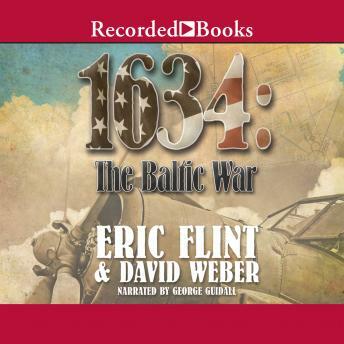 The Baltic War which began in the novel 1633 is still raging, and the time-lost Americans of Grantville-the West Virginia town hurled back into the seventeenth century by a mysterious cosmic accident-are caught in the middle of it. Gustavus Adolphus, King of Sweden and Emperor of the United States of Europe, prepares a counter-attack on the combined forces of France, Spain, England, and Denmark-former enemies which have allied in the League of Ostend to destroy the threat to their power that the Americans represent-which are besieging the German city of Luebeck. Elsewhere in war-torn Europe, several American plans are approaching fruition. Admiral Simpson of Grantville frantically races against time to finish the USE Navy's ironclad ships-desperately needed to break the Ostender blockade of the Baltic ports. A commando unit sent by Mike Stearns to England prepares the rescue the Americans being held in the Tower of London. In Amsterdam, Rebecca Stearns continues three-way negotiations with the Prince of Orange and the Spanish Cardinal-Infante who has conquered most of the Netherlands. And, in Copenhagen, the captured young USE naval officer Eddie Cantrell tries to persuade the King of Denmark to break with the Ostender alliance, all while pursuing a dangerous romantic involvement with one of the Danish princesses.